Heat the cream in a saucepan over low heat, but do not let it boil. Turn off heat and pour in chocolate and butter. Stir until smooth. Stir in Irish cream. Pour mixture into a bowl, cover with cling film and chill in the fridge for 2 hours until firm. Line a baking tray with greaseproof paper. Take teaspoons of the mixture, roll into small balls and place on baking tray. Chill for 30 minutes. Melt milk and white chocolate in different bowls (microwave will do) and leave to cool a little. 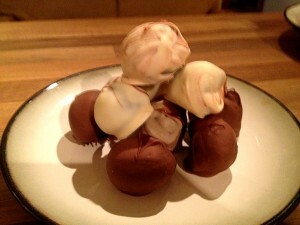 Using a cocktail stick, dip the truffles in either of the chocolates to coat and leave to set on the greaseproof paper in the fridge. This recipe takes a little time, but is so worth it. These are so easy to make for the end of a dinner party as you can make them any time before and keep for up to a week in the fridge.